I just got home from a wonderful, whirlwind trip to my hometown of Seattle. We actually started out in Portland (another favorite city) where my husband and I spent our newlywed years. If you follow me on Instagram, you saw that my little sister, the baby of the family, got married to her sweetheart in a beautiful ceremony on Friday. Kate’s mother-in-law, a good friend of my family, actually did all of the wedding flowers! She did my flowers too, almost 10 years ago, long before Kate and I ever even met one another. People always ask how Kate and I met, and that’s how. It was through her husband’s family. My favorite part about my sister’s bouquet was that beautiful beaded embellishment. It came from our Mom’s wedding dress, and I thought it was the most perfect tribute. After the wedding was all over and the bride and groom were long gone, we went and did something I’ve always wanted to do. I’m not a crazy person, so I would (in the words of Taylor Swift) never, ever, ever jump out of an airplane, but indoor skydiving sounded like a total blast. And it was. 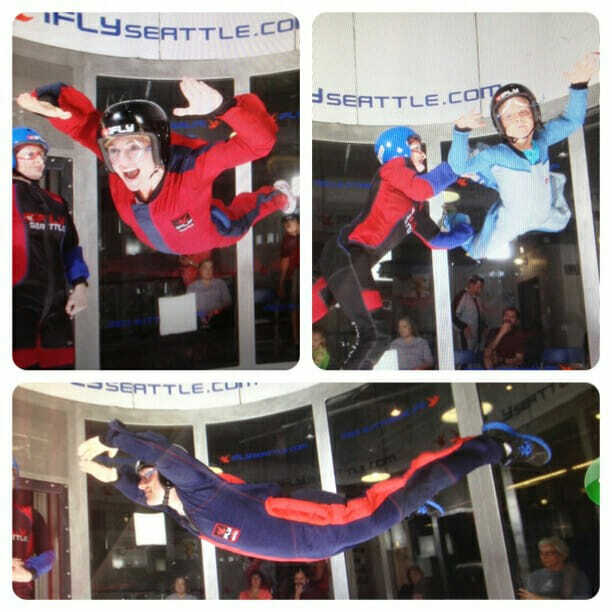 If you have an ifly near you, check it out. It was a dream come true for our kids and I would do it again and again if I lived close to one! Check out this video I posted of our instructor- totally awesome. So anyway, now here I am, at 10 pm remembering I have a blog post to write! And in a way, this recipe is perfectly fitting for today. Sometimes I have a tendency to over-do things. To make things more complicated than they need to be. I have to say, my husband has been a good influence on me in the past 9 1/2 years of marriage because he’s constantly reminding me to keep things simple. With food, it’s so easy to over-think and over-do, and so often the best things are incredibly simple. 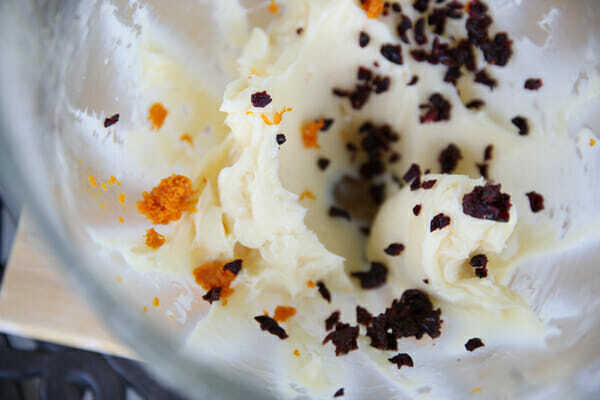 One of my favorite things to make for company, or to take to a party, is a simple compound butter. They’re so easy, and so quick, and all you have to do is grab a yummy loaf of bread at the grocery store bakery, and you made something completely impressive and delicious with a little more than zero effort. 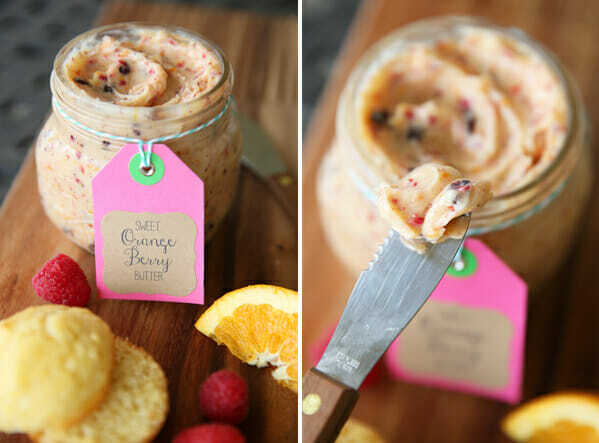 I make both sweet and savory butters all the time, and this is one of everyone’s favorites. 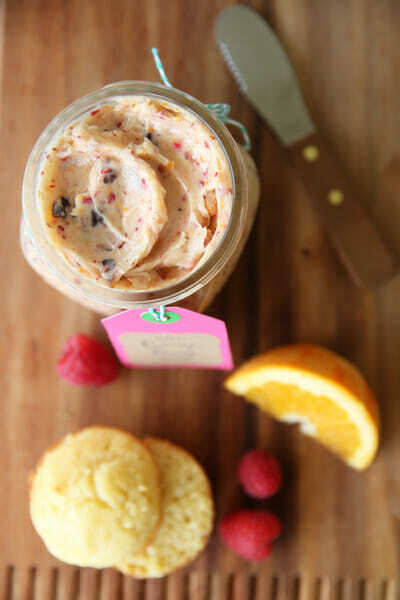 My sister-in-law made us cranberry-orange butter last Christmas and I came up with this recipe after eating that one. The butter starts with a toned-down version of our classic honey butter, with a touch of powdered sugar and honey for sweetness. Whipping that all together makes the butter light and fluffy to start with, and then we can add in some flavor. 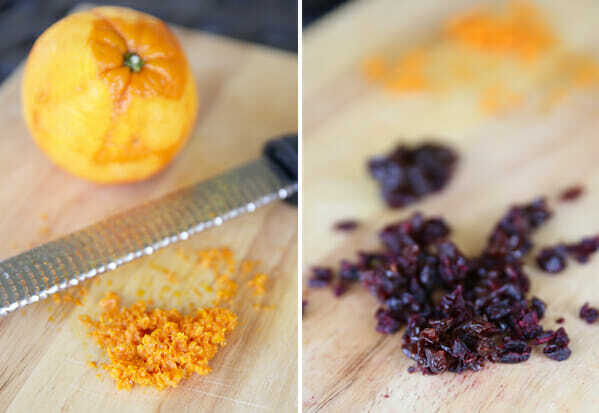 Zest in the zest from one whole orange to add pretty flecks of bright orange color and also bursts of citrus flavor. 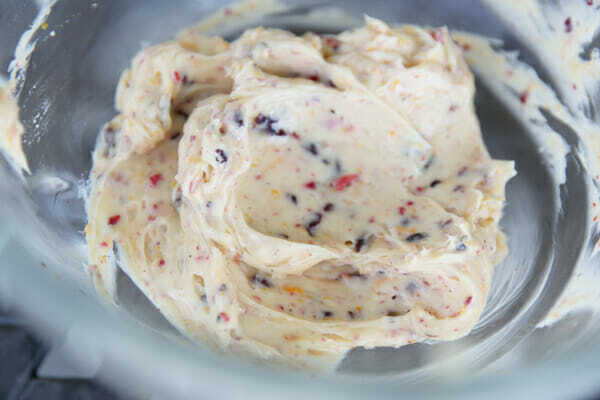 You’ll also add some chopped dried berries. 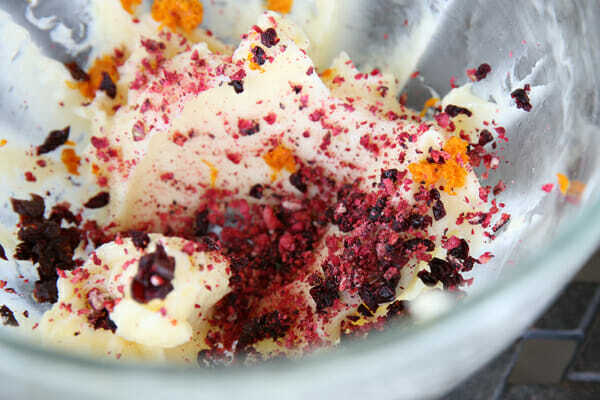 I know some people add fresh berries to compound butters, but it can get tricky because you’re introducing moisture into the mix and it can cause the butter to start separating and make a big mess. So I find that my method (with 2 options below) works well consistently and stores longer, as well. You can usually find a variety of of dried berries at the grocery store (and even more at stores that sell bulk items, and health food stores). 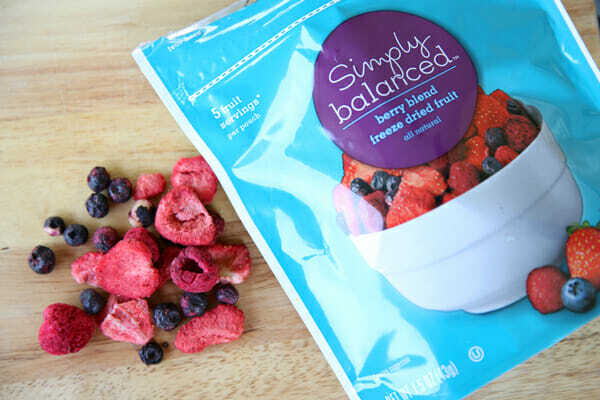 I like the bagged mixes that have strawberries and blueberries, and cherries in them. You can always use dried cranberries, but I do prefer at least a mix of that contains the other berries as well. You’ll also want to chop them quite finely so they’re small enough to spread nicely. Add them right into the butter and mix them in. Using freeze dried berries is another option, and I like to make this with a combination of both. But you can certainly use just one or the other. You can find freeze dried berries in more and more places these days. The ones pictured are from Target. Freeze dried berries are light and crunchy, and kind of melt in your mouth. They’re the kind of berries you find in cereal. The trick when using them here is to allow the butter enough time to sit before serving so the berries can absorb some moisture and lose their crunch. You’ll also want to smash them pretty finely so they just blend in and are able to soften up. Use an electric mixer to beat it all together. 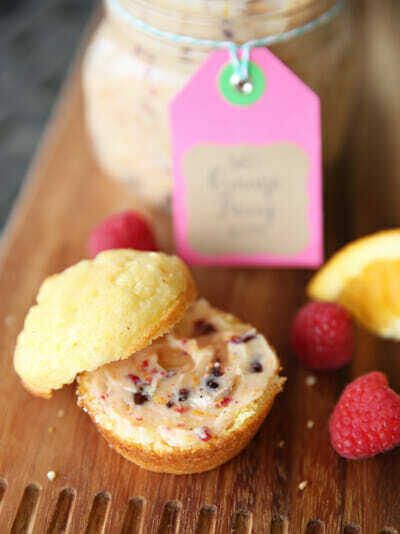 Beating helps to incorporate some air into the mix so the finished texture is really light and fluffy. It needs to be stored in the fridge, but you’ll want to serve it at room temp, so if it’s chilled, just leave it out for about 20 minutes before serving. It’s so yummy on cornbread, baguette slices, or a piece of toast, and especially pancakes, crepes, and waffles. Or a sugar cookie. Or graham crackers. Or anything else you can possibly find in your pantry when you are out of all of the other things I just mentioned. You always have spoons, and eating butter from a spoon is completely acceptable if it’s flavored butter and there are no witnesses. Beat butter, honey, and powdered sugar with an electric mixer for 1-2 minutes, until light and fluffy. Add in remaining ingredients and beat at medium-high speed until combined. Serve at room temperature on toast or french bread, waffles, muffins, cornbread, pancakes, crepes, etc. note: add berries to taste and sub all dried, or all freeze-dried as desired. If using freeze dried fruit, I recommend letting the butter sit for at least 6-8 hours, or overnight before serving, for best results. If you’re in the mood for a dinner recipe- you’re in luck! We added a new bonus recipe to our dinner inspiration page today! Click the green box on our sidebar (or right here) to check it out! Thank you Sara for the picture of Becca’s bouquet. Yes, my favorite part of it was your mother’s beaded embellishment. It is beautiful! It was a wonderful wedding all the way around. 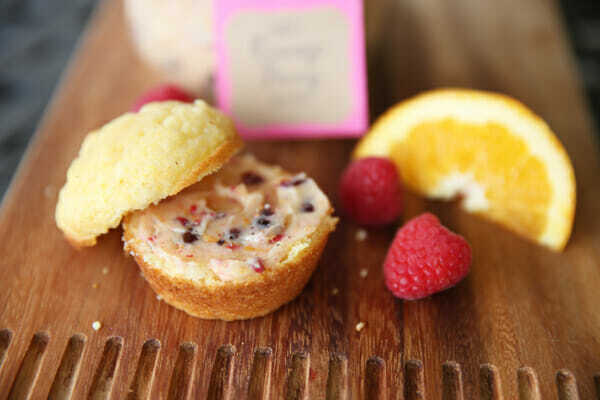 This looks delicious and would be a perfect compliment to some homemade rolls for a nice after school treat. 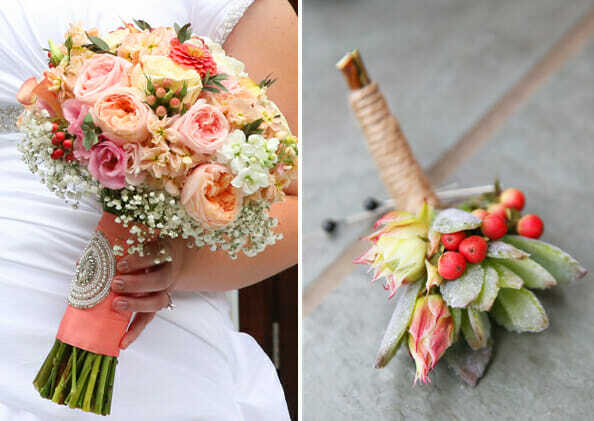 I love the embellishment on the bouquet too, what a wonderful way to carry something of moms with you. 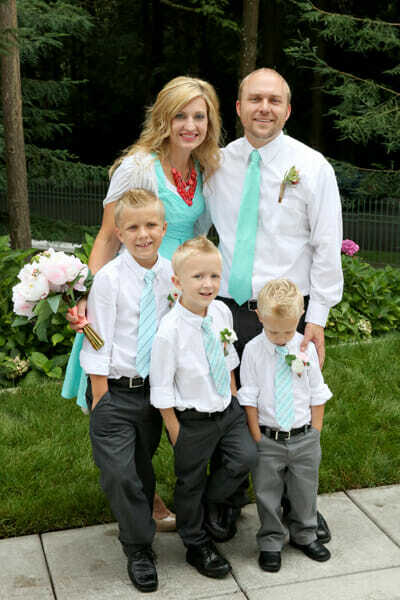 Your family looks so cute, i love the boys ties. Also I think that I am going to look into indoor skydiving for my husband for his next birthday. He wants to jump, but I don’t want him too. Yeah, check it out Susan- I actually got it for my husband’s birthday, too! Also – since you are familiar with the Portland and Seattle areas, any advice on what to see/do on a one day trip to both places? My daughter and I are taking a road trip in a few weeks from Portland to Vancouver, BC, and then back to Eugene. We’re so excited! I’d appreciate any suggestions! Thank you!! Yum! Now this is what I love about OBB! Lol- good to hear it, Sherri! 🙂 Please remember all of our yummy recipes like this the next time you see something that includes Mac n’ Cheese, because there’s a few more of those comin’, haha. We love ya! You have a beautiful family. This butter looks amazing, can’t wait to try it! Haha, thanks Becky. Funny thing is that when I posted that photo my first thought was how frizzed out my hair was in that Portland humidity! I started using one of those cone-style curling irons- I have this one, specifically, and I love it! How long does this butter tend to keep? Does the fruit go bad? This looks delicious. We’ve done iFly here in the San Francisco bay area several times – SO fun. I have to say the beautiful jewels on your sister bouquet is so heart warming. I love this, its the details that make special memories. Congrats! Awww, your family’s so cute! What a great picture. I love how your mom’s wedding dress was incorporated into your sister’s wedding! What a great idea! My mom made my daughter’s baptism gown out of the shawl from my wedding gown (didn’t need it – it was a hot day!) and I hope that it will be passed down in the family. It’s the little touches that mean the most! This totally reminds me of a savory butter I used to make – with a homemade flatbread. My husband asks me to make it all the time (usually as we are just sitting down to eat!) but it’s been a few years since I made it. Yum. This looks so good! I will watch for the upcoming fall butter sales. I see soe Christmas gifts in the near future for all our neighbors. Thanks ladies! I love this idea for gifts!! Could you by chance make those tags printable? I know I’m asking a lot. I’m a huge fan of OBB. Seriously. You might actually classify me as a super fan. Haha, love me a superfan! 🙂 Those are just sticky labels from Martha Stewart’s Avery line. I just popped the text in an on-line template that you can download with them for free. Easy peasy! Where do you buy your cute jars? Those are Ball jars- and you can find them where Ball products are sold; I got mine at Target! No way! Were you from the wedding party with the red dresses?? That’s hilarious, lol! Beautiful picture of your family. I never realized that you had 3 boys. I have four. Aren’t boys fun? I love my boys. Oh, and thanks for the amazing recipe. I can’t find freeze dried fruit in my area. Would regular frozen fruit, or fresh fruit work?